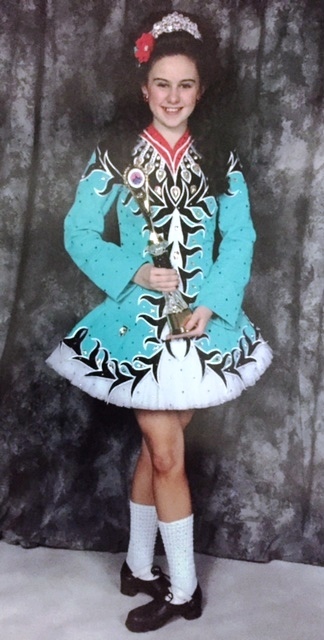 Katie in her Feis dress. When Katie Dudley was five years old, her mother encouraged her to take Irish dance lessons, just as she and Katie’s grandmother had done. Initially, Katie was against the idea, until she began classes and fell in love. Katie’s passion for Irish Step also led her to Pilates. During a summer dance camp, which she’s attended for the past five years, Katie did Pilates for an hour each day. Recently, she began taking private lessons with Personal Euphoria in Wethersfield to continue to enhance her Irish Step. When was the last time you went to a fitness class and it felt good? Hopefully, the answer is, “Yesterday, I love the way my (insert class name here) feels every week.” I hope you thought that. I’m with you. I love to move. Throw me in almost any type of class and I’m going to enjoy it. I’m happy in motion, probably to a fault. But even when it feels good to move, it’s not always fun. There is a free, silliness to movement that we tend not to hold onto as we age. It’s been drilled out of us. I watch my friend’s kids giggling over summersaults. They will spin in circles until they collapse in a heap. I’m not advocating circle spinning. The thought of doing that now makes me nauseous. The last time a rolled down a hill (about a decade ago) I learned that it is more torture than fun in my body. Things change. But kids get so much joy out of motion, and half the moves are concocted, on a whim and beyond goofy looking. They don’t care. Like many little girls, dancing and all the pageantry associated with it fascinated me. Love of the arts and dance in particular always remained with me although I was sidetracked many times throughout life. Eventually, when I began modern dance training and continued with ballet, I realized a personal commitment to ceaseless practice created the illusion of effortless movement. Pilates was incorporated into that training. My goal was and still remains to attain freedom expressed through elegant motion achieved only through a self-imposed physical, mental and spiritual discipline acquired by practice. Everybody seems to be doing Zumba nowadays, and I wanted to see what all the hype was about, so Susan , Donna (two of Personal Euphoria’s instructors) and I went to check it out. I’d seen a video clip online that made me question the fashion sense of people who did Zumba, but I liked the music right away. The class wasn’t quite what I expected—there was no one dressed in bright, outlandish colors; in addition to latin music, they play hip hop; and the instructor rarely talks. I was mildly disappointed about the normal wardrobe choices, but I got over that.